BUY WITH CONFIDENCE - Smokin Beans Coffee Co. is an award winning family-run coffee supplier specializing in SPECIALTY-GRADE COFFEE BEANS. Our coffee beans are carefully selected by our importer specialist who has over 80 YEARS OF EXPERIENCE in the coffee industry. THERE IS A COFFEE ROMANCE AWAKENING NATIONWIDE as so many are discovering the wonderful delights of fresh roasted coffee. Coffee just out of the roaster is SO ALIVE AND BURSTING WITH FLAVOR; this amazing flavor experience is most outstanding in the first 7 days after roasting. This discovery is driving the huge increase in home roasters and new coffee shops. ROASTING YOUR OWN COFFEE CAN BE AN EXTREMELY REWARDING EXPERIENCE. Within every green coffee bean's heart are a collection of locked secrets. One of the pleasures of the home roaster is becoming acquainted with those intimacies in a more direct active way than by simply tasting someone else's coffees. Of course you may not care so much about these secret nuances and flavors if you are satisfied with the supermarket offerings. But if you have had AN EXTRAORDINARY CUP OF COFFEE and have wished you could have that experience more often and possibly even adjust certain things about that cup to your specific delight, maybe slightly darker for instance, or more earthy, or maybe a dash more acidity or possibly a little less, the choices are limited by your imagination and how skillfully you can coax those flavors from their secret hiding place deep within the bean. MAYBE NOW IS THE TIME TO START EXPLORING THE FULL RANGE OF TASTE DISTINCTIONS AMONG THE WORLD'S FINE COFFEES. Why not start with the best coffee beans from Smokin Beans. 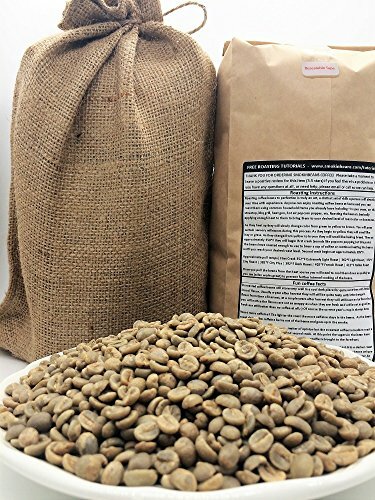 We guarantee you will enjoy our coffee beans; some coffee roasting guidelines are printed on the back of the coffee bag for your convenience. We also have DETAILED ROASTING TUTORIALS AVAILABLE if you need them. Your order WILL SHIP QUICKLY and the coffee beans will store nicely for an extended time in the SEALED FOIL KRAFT BAG.